Robert Sams inspired this post. As we were discussing stacks (software, IT) and the draw backs of the bitcoin blockchain architecture recently in London, we slowly gravitated towards a new term… Consensus Computer (CC). 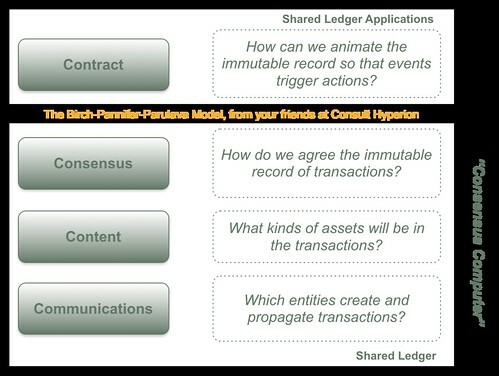 Having finished working on our four layer shared ledger model with my colleagues Steve Pannifer and Salome Parulava at CHYP and having used that model with clients in a few different countries to help management begin to formulate strategies around shared ledgers, and the blockchain, I thought it might be interesting to add this (i.e., Robert/Pascal’s formation) to our model to see if helped us to think more clearly and have more effective communications. So here’s the new version of Birch-Brown-Parulava four layer shared ledger model with the Bouvier-Sams boundary (as I now call it) in place. I’ve now used this with a few groups to help them to think about the potential for “smart contracts” in a variety of real-world applications and it’s proved rather useful so I think we’re going to stick with it for a while. By encouraging people to see smart contracts as applications, I think it sets up a different context for conversation. Smart contracts are not really contracts (or smart). Indeed, as my good friend Gideon Greenspan pointed out yesterday, you wouldn’t necessarily store contracts on a blockchain anyway. When you think about smart contracts as a new class of application, however, you begin to see what the new architecture can bring to the party. The ability to execute general purpose code on the consensus computer means that, just as the ability to executer general purpose code on conventional computers did, people will create some amazing things that we can’t imagine right now. I’m looking forward to that, and I’ll be talking about this sort of thing on the Distributed Ledger Technology panel this afternoon Cards & Payments Australia, hope you can join us.